Our Autumn Sale has been EXTENDED! From now until the 28th of September you will be able to book rooms from just £9.99. You’ll find these sale rates between the dates of 01/10/18 and 06/05/18. Not sure where to find the rates? Use our pricing calendar to search prices over the whole month and see the cheapest rates and availability. You'll generally find the most sale rooms on Sundays - check out Newcastle, Leeds and Barcelona for some great Sunday rates. Why not check out Sheffield? You can find rooms from £9.99 all the way through from Sunday to Thursday. We are selling rooms quickly, so the faster you book the better! Offer subject to availability. Stay dates are from 1st of October 2018 until 6th May 2019. Bookings are non-cancellable and non-refundable, promotional rates only apply to new reservations. Payment is made at the time of booking. This promotion is not applicable for groups and can’t be used in conjunction with any other sales or promotion. 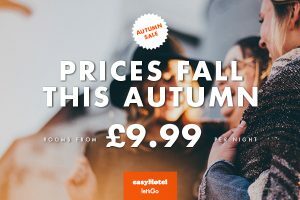 Promotional rate is only valid for bookings made on www.easyhotel.com between the 17th of September 2018 and 25th of September 2018. easyHotel reserves the right to change or cancel the promotional rate at any time and cannot guarantee availability for any location on a specific date. Rate excludes the administration fee. Participating hotels include: London Croydon, London South Kensington, Manchester, Birmingham, Newcastle, Liverpool, Glasgow, Barcelona, Sheffield, Leeds, Amsterdam Arena Boulevard, Amsterdam City Centre, Amsterdam Zaandam, Maastricht City Centre, Rotterdam City Centre, The Hague City Centre, The Hague Scheveningen Beach, Brussels City Centre. Please see our Deals page for all participating hotels.